WYCE's Spring Fund Drive begins Friday, April 20, 2018 and is followed by a programmer training orientation and the National Federation for Community Broadcasters Midwest Summit. 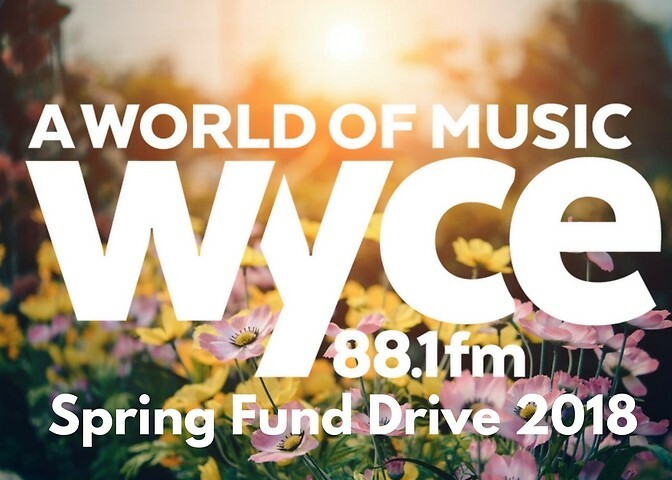 WYCE's Spring Fund Drive is on its way - Friday, April 20-27, 2018! The unique music variety we've shared for over three decades is made 100 percent possible by donations from our listener sponsors...we need you to keep doing your part! We receive no funds from any university, religious organization, or from the government. So tune in April 20 - 27 to make your financial contribution. Your early gift may be used as challenge funds - encouraging others to give during the drive-motivating those individuals to take the big step from listener to listener-sponsor. 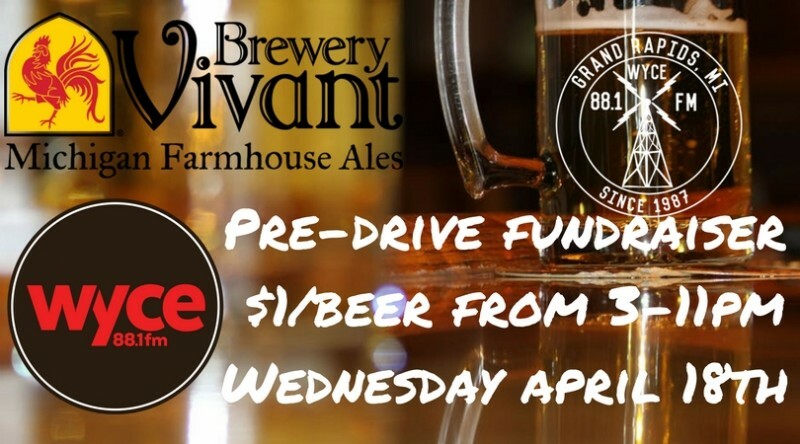 Join us Wednesday April 18, 2018 at Brewery Vivant from 3 p.m.-11 p.m. where $1 of every beer sold goes to the matching funds pool to kick-start the drive ahead. This year's incentives include 'Dinner and a Show,' summer music festival passes, Meijer Gardens Memberships, Black WYCE logo T-shirts, and new logo baseball caps. The station is introducing a new level in cooperation with local music venues. At the $25 level donors receive a “FlexPas." This pass allows you a pair of tickets to any one show at your choice of The Pyramid Scheme, The Intersection Venues, or Tip Top Deluxe. Present your FlexPass at the door of any show offered for a $20 ticket price that is not sold out. FlexPass at the $50 level allows a pair of passes to one show at each venue (under $20 and not sold out prior to doors) The Pyramid Scheme, Intersection Venues, and Tip Top Deluxe. We hope to offer this great exchange to introduce new and younger donors to giving to community radio right here in West Michigan. 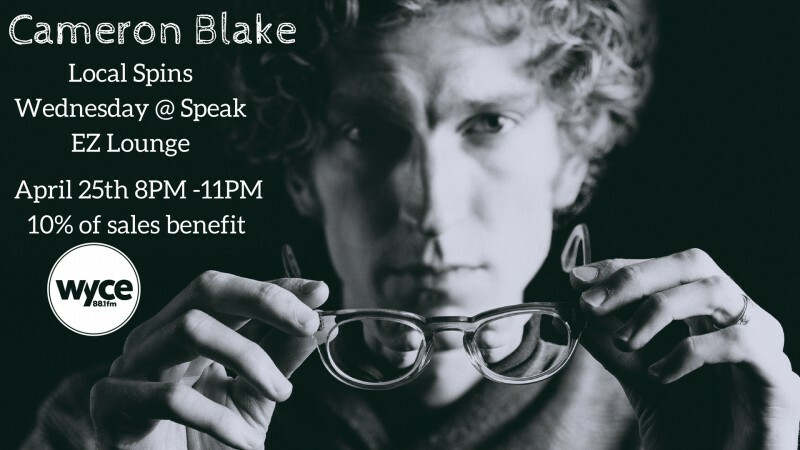 Local Spins Wednesday at Speak EZ Lounge will welcome Jammie nominated Michigan artist Cameron Blake with Oh Brother Big Sister for a live show on April 25, 2018. Because this night takes place during WYCE’s Spring Drive Speak EZ Lounge has committed 10 percent of the night’s sales to the station. If you've ever wanted to get involved with WYCE, join us for an orientation to on-air programming! WYCE and Grand Rapids Community Media Center present a free and open volunteer orientation meeting for all who may have wondered "What is GRCMC?" "What is WYCE?" and "How can I get on-air?" The orientation is in Wealthy Theatre's Koning Microcinema on Monday April 30, 2018 at 6 p.m.
No commitment is necessary to attend. In this session, we will discuss the mission and history of Community Media Center and WYCE. We'll also outline the upcoming programmer training course and our expectations for all new WYCE volunteer programmers. 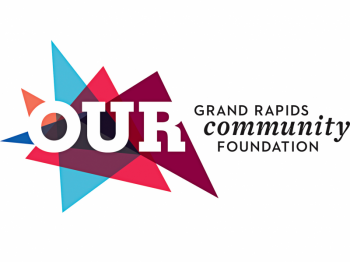 Panels and workshops as well as a reception event will be offered on location of the Grand Rapids Community Media Center and Wealthy Theatre. Our own Music Operations Coordinator Shane German will guide a workshop for memebers on Designing Music Programming for Audience and Impact. From music education training WYCE does with its DJs to the fine points of SoundExchange and music rights, the session will explore a set of practices that improve on air sound. Other speakers and workshop leaders include Neenah Ellis of WYSO, Melanie Coulson of Greater Public, Michael Beach & John Groundwater of NPR, Joe Voss of Creative Many Michigan, and Julia Haslanger with Harken.